We live on several acres, but only about 30 feet of it is not wooded so I knew that on my property, a traditional garden would not work. As I researched my options, I discovered square foot gardening. Square foot gardening is when you don’t plant directly into the soil, but instead, you plant in a bed you have made and filled with dirt. In fact, if you can build the raised beds, I would recommend square foot gardening over traditional gardening because of the lack of weeds. Also, you don’t plant in rows, you plant in a grid. It’s amazing how much you can grow using this method. My sister was able to raise all of the produce her family ate for the entire growing season in a 4 foot by 8 foot bed last year! We now have fresh produce throughout the entire growing season and I don’t purchase any produce from the grocery store during this time. What about produce during the non-growing season? In order to have produce during the year, I joined 4 other families and planted an enormous garden on one of the other families’ properties. With this garden, I am able to can and preserve produce for the entire year. The result is, I am able to feed my entire family on $20-$25 each week — an incredible savings! Don’t assume a garden isn’t an option for you. Almost anybody, anywhere can garden! Even if you don’t have a yard, if you have a deck or porch or patio of any sort, you’d be amazed at how much you can grow in large pots! Read more of Rene’s gardening tips, along with other frugal living ideas at Budget Saving Mom where she also blogs about being a good steward of what the Lord has blessed us with, homeschooling, freebies, and coupon tips. Looking for more? Read more posts about Gardening. We have never tried this, but this year we are trying vertical gardening. We are living in an apartment, with only a small area behind our apartment. We are potting plants in long/deep pots and have obtained tiered plant stands where we are putting potted vegetables and herbs. We are hoping that this will allow for adequate space for plants to grow. We’re putting the larger plants–tomatoes in their own round pots. We also have hanging baskets with strawberries in them. None of these were new when Mel assembled them into SFG but they’re a great combination. Dense planting is a good idea because you need less space; rows are good if you have space or are using machinery but a staggered layout like SFG is easier to weed (at least for me). Dense planting is what makes SFG really good for small spaces. Training the big plants on a trellis again saves space. It also makes produce easier to pick and prevents some spoilage because the veg isn’t lying on the ground. Rich soil means more productive space. Mel now recommends raised beds but it’s not necessary. You can plant in plain old soil, or soil enriched with compost, or “Mel’s Mix” (which isn’t cheap, btw) or whatever suits. I do a version of SFG in a 15’x3′ strip in front of my house. Veggies in the front yard isn’t the usual choice but I make sure my trellises are nice looking and because I pass the garden at least twice a day it’s easy to keep up with the weeding – I spend less than a minute on the way in and on the way out. Speaking of weeding, here’s an idea to help newbies (like me!) distinguish the small seedlings from the weeds. I mark each planting site with a wooden toothpick. If the little plant is near a toothpick, it’s probably a veggie plant. If it’s somewhere else it’s probably a weed. It also helps me figure out what’s sprouted and what hasn’t. So glad to see Budget Saving Mom posting on her gardening efforts here. She’s a superstar in the area of gardening and her videos on raised beds are awesome! actually what she’s describing isn’t exactly just square foot gardening. SF can be done in the ground, not requiring a raised bed. and broadcast seeding, as opposed to rows, is from a method called french intensive gardening. 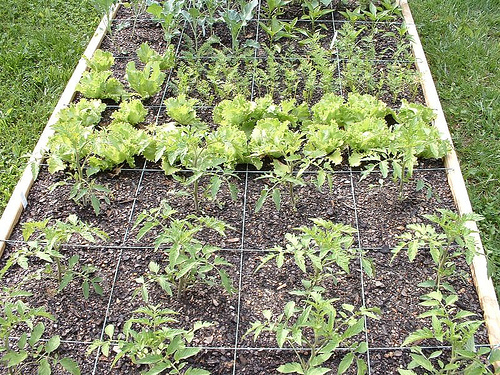 again you don’t need a grid or a raised bed. that said, the raised bed does help in many ways, particularly if you want to concentrate soil amendments. I’m a big fan of Mel Bartholomew & am using a variation on his square foot gardening technique in my own garden. However can Budget Saving Mom REALLY feed her family on $25 a week?? Holy moly. I spend 1/3 of that just on milk every week. Plus, personally it wouldn’t be worth it to have no fresh vegetables all winter. Canning & preserving can save you a lot of money, but I would want to supplement it with fresh produce at least half the time to add interesting textures, healthy vitamins & fresh flavors to our meals. I agree that I definitely wouldn’t want to live without fresh produce! @Rachel, I am actually really fortunate since I live in the south. Our growing season lasts at least 10 months out of the year. This year, I actually have a greenhouse, so I will be able to enjoy our fresh fruits and vegetables all year. I am really excited about that! It will be great. @Rachel, I spend $11.00 on organic milk every week and another $5+ on almond milk! Ok, maybe this is what I should try instead of an indoor garden. I love in a home where rabbits, deer, prairie dogs and all kinds of birds and other animals run rampant. I know they will eat my poor garden before it flourishes. Maybe if I elevate it and try square foot gardening, I can have my fruits and veggies and eat them too! @Marquisha, Elevating it won’t keep the animals out, unless you plan to put it up 10 or more feet in the air! You can try 4’x4′ raised beds surrounded by 5′ fences (you can use plastic mesh or chicken wire. This will keep the deer out (because the space is too confined for them to jump into and out of, but you might have other things that will dig under the fence. Awesome! Our backyard is too shady for a garden, but this year we joined the community garden. It’s only 5 minutes away, and only cost $25 for the growing season. The plot is 18 x 30….HUGE. We’re having a great time with it! I would love some info on what can be grown indoors. Anyone have tips on that? @Barbara, If you have full spectrum “grow lights”, you can grow a lot of things indoors. It’s expensive though. @Barbara, I think that most things you grow outdoors can be grown indoors as long as they get 6-8 hours of sunlight a day and the right temperatures. I think it really depends on your setup, the size of pots and so on. Square foot gardening or intensive gardening is the best! Less weeding, no tiller needed, less space needed, looks better, etc.! We’ve been doing it for about 6 years now, and would never go back – even if we had more room. We just plant right in the ground, in soil that we have amended. We have pavers down to walk on between the squares. They make it easy to train the kids where they can walk. I love square foot gardening! This is my second year using this approach. You can definitely get way more in this way. I had been planning to expand the size of the garden until I tried this approach and am totally happy with how it works out…and I didn’t have to take up more of the yard and still got more produce planted! I love square foot gardening. We started it this year for the first time, and it is doing wonderfully. It is super convenient, and easy for the children to help with as well. I live in an apartment with only a small patio, but I did really well last year growing cherry tomatoes, hot peppers, and herbs. We eat tons of spaghetti because it is very inexpensive, but when it’s dressed up with fresh basil, oregano, tomato, and peppers, it is a treat instead of a necessary economy. Even if you can’t grow all your produce, I recommend a few pots of herbs, they’re easy and rewarding. I’m hooked on square foot gardening. Last year my husband and I built our first box. This year we added two more boxes and expanded to all sorts of new vegetables like peas and broccoli. I’m super excited about my zucchini which is growing huge! Thanks for sharing! I would love some ideas on how to frugally plant flowers, etc. We have a large yard with lots of beds but no money to fill them or mulch them! YIKES! I would love tips, ideas on how to find inexpensive annuals, perennials, etc. Thanks! @Jen, I just found some 4″ annuals at Home Depot for $.50 each. I thought it was a bargain. Call ahead to see if the sale is still going on. @Jen, We get our wood chips from a local guy that cuts down trees for a living. We live in Wisconsin and he charges $75 for a truck full and that is about 10 yards. Its a great deal! Sometimes we split the load with neighbors. We have never had problems with the wood being diseased, but its only run through the chipper once and sometimes there are some sticks which we just pick out. Its not a nice soft mulch, but it works for us. @Jen, Here’s a tip if any of your local schools have agriculture classes or an FFA (Future Farmers of America) organization. The FFA at our school grows plants in their greenhouse and then has a big plant sale each spring. The plants are beautiful and only cost a fraction of what you would pay at a retail store. I was able to get dozens of tomatoes, peppers, broccoli and flowers for only $29! @Jen, Ask friends, family, neighbors, etc…Usually plants need to be split, so we are always getting free plants from friends. We are now at the place where we can split ours and give to others. I’ve been square foot gardening for 4 years and love it. I had checked out Mel’s original book from the library and then later got his new version. I prefer the original because I have GREAT soil and don’t need to build raised beds. Vertical gardening with SF has been fun too. Awesome Rene! My garden is looking really good- the best we have ever had! There is nothing better than fresh vegetables and I love involving the kids. My three year old is so excited to see the plants growing! I also really like the fact that everything is organic. My boys can pick and eat straight from the garden! I live in a warm climate (zone 9) and I plan my garden so that I can harvest all year, but that doesn’t mean you can’t do the same in a colder climate. There is a book called Four-Season Harvest, written by a man (Eliot Coleman) in Maine who harvests from his garden year-round. If you live in the Pacific NW, there is a book by Steve Solomon called Gardening West of the Cascades that has great tips for harvesting year-round in that region. Preserving is important, too. I have a friend who lives in North Dakota who has a relatively small garden, but who manages to grow and preserve enough fruits and vegetables for her family for almost the entire year (she only spends $20 a year on produce, in the middle of winter) in her garden. Even though she has half of the year with several feet of snow on the ground, her family eats frozen and canned fruits and vegetables (including apple juice) from her garden. Don’t be afraid to take out trees that are overshadowing your yard, and replace them with fruit trees and berry bushes! I have 33 semi-dwarf and dwarf fruit trees in my backyard, and I only have a .24 acre lot. I live in the middle of the desert. Yesterday we harvested cherries and asparagus! We are dependant on our garden as our only source of fresh fruits and vegetables, as we have been living from our pantry for months (again). So, when you plant your garden, don’t forget fruits! We have planted our first square foot garden this year and it is amazing how lush and healthy and easy it is! We are already eating from the herbs, lettuces, and cucumbers and hope to have our first peppers ready by the end of the week. Last year, we bought some Earth Boxes and grew peppers and tomatoes just to try our hand at growing veggies. That was a great way to dip our toes in the water. Both methods have little to no weed issues – which is great! I tried gardening for years without success, but when I tried square foot gardening I was amazed at how easy it is and how well the plants grow and produce. Of course, this year I’m way too busy to even think about planting a garden of any kind, but I’ll be back to it next year. I’m so glad this trend is catching on. I live on a tiny lot (we have a 4’X6′ plot of grass!) but I am growing lots of herbs, lettuce, snow peas, and zucchini right now. I’m planning on adding one of those tomato bags when we get past the danger of frost. You can grow a ton in a small space IF you have sun and great soil. Yea! Now if only they would come out with hybrid vegetable plants that thrived in shade! The only sun we get is right along the street curb and if we tried to plant vegetables there it would look very odd considering we do have a normal size albeit shady yard between the street and house. Worse yet I doubt we would have anything left to pick after all the school children and bus commuters walked by each day. Try edging your garden in front with lettuce. It can be fancy, and the children most likely won’t touch it. Blackberries will grow in shade. Can you remove other large tres and replace them with semi-dwarf fruit trees? You’ll let in some sun and also provide fruit. A front yard can be a beautiful source of food without being obvious. You can grow a hedge of blueberry bushes, or you can grow several fruit trees together as a hedge (a hedge of apples, for instance). You can stick herbs in the front yard. At my last house, I grew swiss chard in my planter between the roses and the hedge. I also had lavender and mint. My neighbors never realized I had food growing out there! @Diane, Diane, I would try using landscape gardening. Like, the Prudent Homemaker said, lettuces can be really beautiful. Here is a post about how to use lettuce in your landscape. I talk about how to harvest the lettuce through cutting so that you will have fresh, and sweet lettuce for a longer period of time, and it won’t bolt and become unattractive. Also, consider planting fresh herbs as a flower garden. They can make beautiful flowers. If you are looking for an edible groundcover, you can try strawberries. These thrive in the shady areas of my yard. Also, all of my berry bushes do well in partial shade. I am slowly replacing my traditional bushes with berry bushes each year. The one thing I can grow really well are the weeds so I use black weed blocker between the rows and cover it with old straw. Can’t tell you what a life saver that is! I started square foot gardening for the first time this year. We always had huge garden growing up and I remember all the hard work as a kid picking weeds and tending the garden. At the suggestion of my dad I bought the Square Foot Gardening book and haven’t looked back. It’s great! No weeds to pick. I hardly have to do anything it seems accept watch the plants grow. And it hardly takes up any space.